How soon will ISIS be defeated in Syria? An Iraqi special forces soldiers walks through a house destroyed in an airstrike during a battle with Islamic State militants in Mosul, March 2, 2017. Victory over ISIS appears within reach, but experts predict that the war in Syria will continue for some time to come. According to Iraqi TV channel Al Sumaria, ISIS leader Abū Bakr al-Baghdadi recently issued a “farewell message” in which he allegedly acknowledged defeat in Mosul—where ISIS is being attacked by Iraqi troops supported by the United States—and urged his supporters to either flee the city or become suicide attackers. However, Al-Baghdadi's statement appears rather suspect. Experts point out that ISIS rarely issues defeatist rhetoric. One theory is that the Iraqi government manufactured this piece of misinformation in order undermine morale among ISIS fighters. What is clear is that the so-called Islamic State is in a precarious position, and the territory under its control is shrinking rapidly. Nevertheless, it is still early to discuss a complete victory over the organization. In part, this is because the forces fighting ISIS in Syria have been unable to agree with each other to an extent that their disagreements border on internecine conflict. Against this background, Russia is attempting to negotiate an agreement with the U.S., Turkey and the Kurds in order to determine an overall strategy for the fight against ISIS. The Iraqi army, along with its Western allies, is currently squeezing ISIS out of their "capital" of Mosul. In January, the government took control of the eastern part of the city. The fight for western Mosul is currently under way, with government forces slowly but surely seizing control of district after district. At the same time, ISIS has suffered a number of key losses in Syria. On Feb. 23, Turkish troops drove the militants out of Al-Bab in the north of the country, and on Mar. 2 Russian Defense Minister Sergei Shoigu reported that the Syrian army, backed by the Russian Air Force, had captured Palmyra, which had been under ISIS’ control since Dec. 2016. 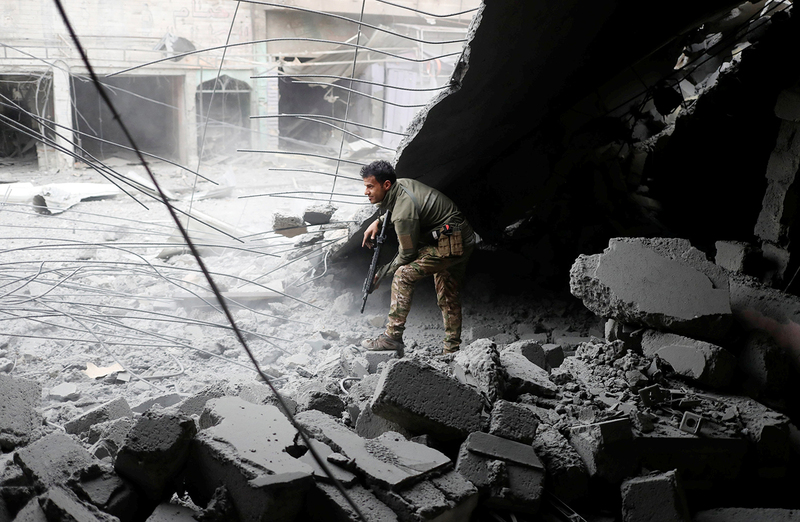 However, despite victories over ISIS in Syria and Iraq, experts and government officials warn that it is still too soon to say that the organization has been defeated. For example, the commander of the international coalition against ISIS in Iraq and Syria, Lt. Gen. Stephen Townsend, said that in Mosul alone at least 2,000 terrorists still remain, and the coalition still has some fierce fighting ahead. "I do not believe reports [by Iraqi media] that ISIS members are leaving their positions en mass and are fleeing,” says Grigory Kosach, a professor in the Contemporary Oriental Studies Department at the Russian State Humanitarian University. According to Kosach, militants are well versed in urban warfare. Using underground tunnels, they carry out sneak attacks against the advancing army, even in areas that have already been taken by government forces. "There is fierce fighting under way in Mosul, and the same will happen in Raqqa [the Syrian "capital" of ISIS], when government troops start storming that city," Kosach predicts. Raqqa, situated in eastern Syria, remains the militants’ main stronghold since losing Mosul. Fully defeating ISIS will necessitate storming Raqqa, but currently there are no forces available to carry out this operation. The strongest positions for launching an offensive on Raqqa are situated in northern Syria, where ISIS is being fought by Turkish and pro-Kurdish units of the Syrian Democratic Forces (SDF). At the moment, however, these two forces are more focused on fighting each other than on defeating ISIS. The Turkish army entered Syria in Aug. 2016. While their official goal was fighting ISIS, experts have repeatedly suggested that Turkey’s real motive is to prevent the creation of a Kurdish autonomous territory in northern Syria. Once ISIS was expelled from the north of Syria, Turkish President Recep Tayyip Erdogan promised that the next target will not be Raqqa, but rather Manbij, a city under SDF control. The Kurds, who play a key role in the SDF, view Turkey as being complicit in terrorism and are ready to fight. At the same time, the U.S. supports the Syrian Kurds, who play a key role in the SDF. On Feb. 28, it was reported that U.S. Special Operations forces had been deployed near Manbij. This creates a tense situation, putting Turkey on the brink of confrontation not only with the Kurds, but also with the United States. Anton Mardasov, head of the Department of Middle East Conflict Studies at the Institute of Innovative Development, says that Russia has found itself in a very difficult situation "between three fires." It supports Bashar al-Assad but also seeks to maintain good relations with Turkey while simultaneously trying to prevent a war between Turkey and the Kurds in northern Syria. Mardasov cites a Mar. 2 statement by the SDF stating that the Kurds have agreed with Russia that al-Assad’s army units will act as a "buffer" between Manbij and the Turkish army. Thus, according to Mardasov, Russia—together with the U.S.—is attempting to separate the Turks and Kurds in order to come to an agreement on the status of Manbij and then redirect the efforts of the Turkish army to storming Raqqa. Mardasov told RBTH that the situation remains unclear: "Syria, of course, will be discussed at the meeting between Putin and Erdogan in Moscow on Mar. 9. Until the results of these talks are known, it is difficult to draw any conclusions." The position of the new U.S. administration is not clear yet either, Mardasov notes. So far, Donald Trump has not made any statements regarding the Pentagon’s report on the strategy for fighting ISIS. In any event, it is unlikely the Islamic State can be fully defeated until its numerous opponents manage to resolve their own conflicts and concentrate all efforts on defeating ISIS.